Korg SP280 Digital Piano Review - Are you ready to learn more? Korg’s SP280 digital piano is a must have item. The Japanese company Korg has an over forty-year history. Throughout that time, they have been making a name for themselves. Korg is known as a premiere manufacturer of digital and electronic music equipment. A quick look at the company’s website shows a range of products. 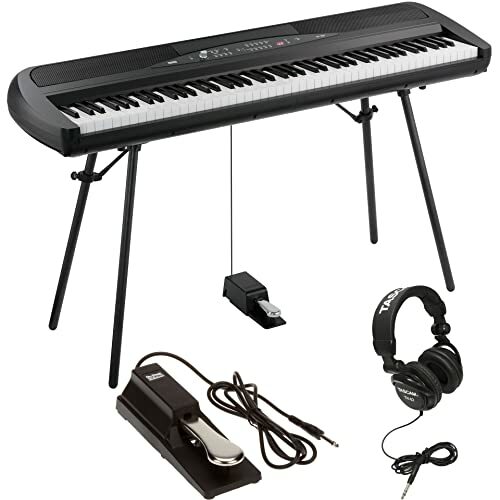 You will find items for DJs, computer gear, synthesizers, and digital pianos, among others. It makes sense, then, that the Korg SP280 digital piano would be a leader in the field. If you want a lightweight, versatile, and durable digital piano, then you need a Korg SP280. You don’t just have to believe us. Read on to find out more for yourself. Before we discuss the Korg SP280 in more detail, we have to go over some specifics. The Korg website lists all of the specification for the SP280. But, below we’ve listed the ones most helpful in your search for the best digital keyboard. If the Korg SP280’s specification do not meet your needs, you can learn about another great digital piano by Korg here. Now that you’ve had a chance to learn about the Korg SP280’s specs. So, let’s dive into some of the features of this digital piano in more detail. The Korg SP280 comes with a number of wonderful piano sounds. There are four different piano samples. These inlcude Grand Piano (D1 amenoniwa), Grand Piano (D2 nocturn), Live Piano (D3 Danny Boy), and Stage Electric Piano (D4 JamSession). Switching between these will help direct your dynamics. The four piano samples are easily changed. They will also respond to even the lightest touch. In addition to the four piano samples, the Korg SP280 comes with thirty other high-quality sounds. It would take too long to list them all here. However, there is a full complement of strings, organs, harpsichord, and clavichords for you to choose from. While the Korg SP280 does not have all of the synthesizer sounds that one might find on a stage piano, the digital piano does have MIDI capability. All you have to do is plug in your MIDI device. Then an entirely new world of sounds open up. All of Korg’s digital pianos are designed with style in mind, and the SP280 is no different. It looks differently than many digital pianos. It has a keyboard and a stand. Often, digital pianos, including Korg’s own models, as designed to look like upright pianos. But, the SP280 looks more like a stage piano. The Korg SP280’s streamlined and lightweight design is complimented by its stylishness. All of the edges are rounded on the SP280. Plus, the stand legs attach at slight angles. The small details on this digital piano make it stand apart from the competition. By usability, we mean both the ease with which you can play the Korg SP280 and also the transportability of this product. Let’s start with playing the SP280. Most importantly, the keyboard on the Korg SP280 has eighty-eight keys. This is the same number as on an acoustic piano. So, you will be able to switch between digital and acoustic pianos easily, without any transition time. Additionally, the keyboard on the SP280 uses natural weighted hammer action (NH) keys. This is not as fancy as the keyboard on the Korg LP280-88, which uses (RH3 (Real Weighted Hammer Action 3) keys. Still, the NH keyboard on the SP280 is designed to respond like an acoustic piano. Plus, you can adjust the dynamic and response levels depending on your own touch. It doesn’t get more flexible than that. Also, the Korg SP280 is easy to move around, which separates it from other digital pianos. Often, digital pianos are only slightly less heavy than acoustic uprights. They can be over two hundred pounds. On the other hand, the Korg SP280 only weighs 41.89 pounds including the instrument stand. The keyboard just weighs over five pounds. Therefore, it is easy to move the Korg SP280 around your home or to a gig. Finally, we are going to remind you about the Korg SP280’s pros and cons. Consider these carefully before you make your purchase. When you purchase the Korg SP280, you receive a product backed by Korg’s famous name. Korg is known for their hand-made, high-quality products. The SP280 fits right into their reputation. In addition to your purchase of the Korg SP280, you also receive a stereo headset. The headphones are specifically made to work perfectly with the sound of the Korg SP280. There is also a built-in metronome on the Korg Sp280. It comes with the ability to change many settings. These include the tempo, time signature, accent, sound, and volume. This level of control is unique among most metronomes. There is only one pedal included with the Korg SP280. 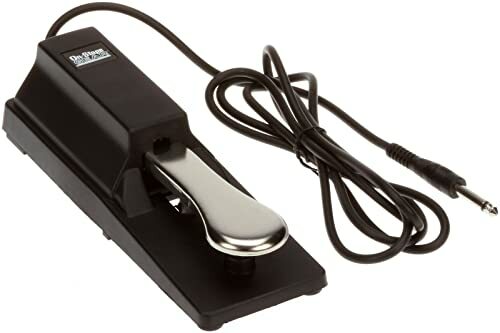 It is the damper pedal—the most used pedal on an acoustic piano. However, if you want the full compliment of pedals that you would find on a conventional instrument, you will need to purchase them separately. The Korg SP280 is not a stage piano, even though it looks like one. This could confuse some potential buyers. If you are looking for a compliment of synthesized sounds and recording/playback ability, then the Korg SP280 may not be for you. Obviously, we think the Korg SP280 is an amazing digital piano. It is easily moved from one location to another. But, still has the great piano sound you would expect from a Korg digital piano. 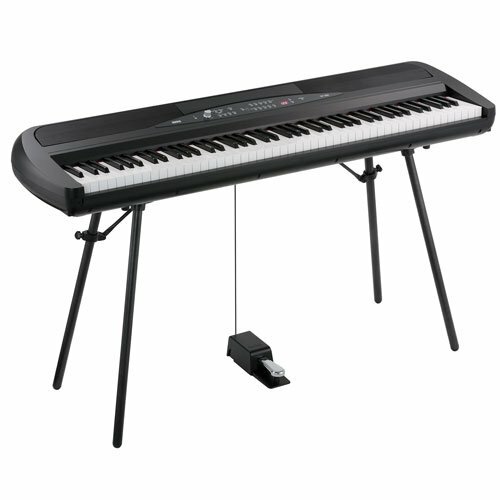 If you are looking for a cross between a stage piano and a digital piano, then the Korg SP280 is the product for you. However, if you prefer to purchase an instrument that has more bells and whistles, we can offer a couple more options. Check out a couple stage piano or digital piano reviews for more ideas.